We wanted to share a reminder for the upcoming 10th Annual Hop Conference scheduled for Thursday, February 21st. You can now view the Detailed Agenda for the day. Registration fees are $75 per person, $65 per NeHA member and $35 for the live broadcast. This year’s live broadcast will be recording all presentations except for the two breakout Foam Brewery sessions, as they will be held in a different room. If you wish to take advantage of our group rate to stay a night at the DoubleTree by Hilton, you need to reserve before this Friday, Feb. 15th. A block of rooms is available at the DoubleTree by Hilton Burlington only until Feb. 15, 2019 for the rate of $122/night. Call 1-802-865-6600 and use Group Code: HOP or register online at https://bit.ly/2RWJdAP. Come help us celebrate our anniversary of the 10th Annual Hop Conference! Malt Barley and Hop Quality is just one of the afternoon sessions you can choose to attend at the Annual Crops & Soils Field Day on July 26th at Borderview Farm in Alburgh, VT. Andrew Peterson of Peterson Quality Malt will talk about malt barley quality and scouting for grain diseases. 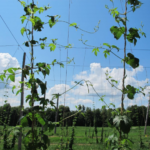 The NWCS team will talk about hop quality including harvest timing, crowning, irrigation, scouting for pest and natural enemies, and end-of-season disease management. www.regonline.com/2018cropsfieldday or call Susan at 802-524-6501. Fee includes a great lunch, Tasting Tent sampling, and Kingdom Creamery ice cream! It’s been a hot and dry start to the season and our hops are thirsty! Given our exceptionally dry start to the season and general lack of rainfall, higher irrigations rates may be needed this year to continue healthy bine growth and flower development. Irrigation allows you to apply water directly to your plants and can increase overall yields along with many other benefits. 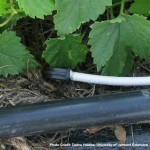 We strongly recommend that you irrigate, but how much water do your hop plants really need? In general, hops in our region require 24-28 inches (651,696-760,312 gal/acre) of water per year and will require regular weekly irrigation supplementation to help combat moisture stress and continue healthy growth. In addition to the benefits on plant growth, regular watering can keep plants stress free and sometimes even reduce pest and insect pressure in your yard. 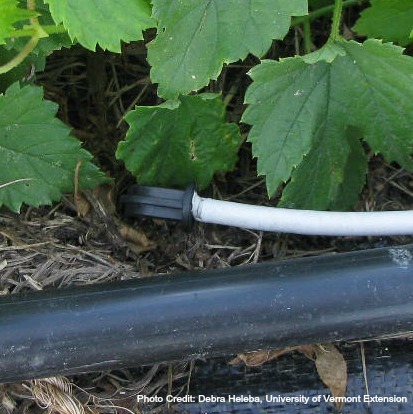 Irrigation systems can help to alleviate some of the potential drought stress, but timing of water application is just as important as the amount of water hops are receiving. 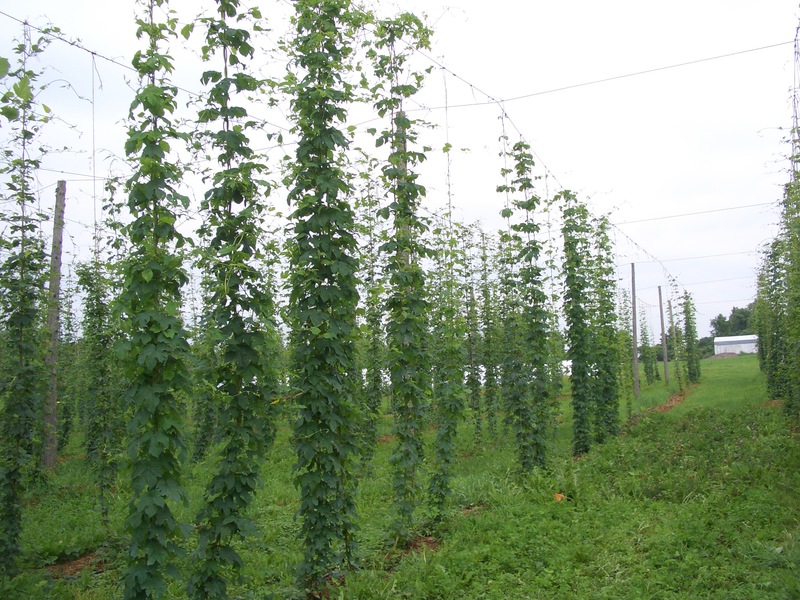 Hops require most of their water between training and flowering for optimal vegetative growth. 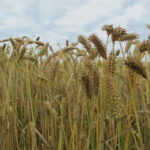 With variability in growing conditions and water loss through climatic conditions such as temperature, humidity, wind, and sun intensity there’s potential for significant water loss in any given growing season. We determined weekly irrigation requirements in each month of the growing season for one plant based on potential evapotranspiration (PET) rates in Burlington, VT (Table 1). To determine actual weekly irrigation amounts, weekly precipitation should be subtracted from the weekly irrigation. Given these weekly rates, it is often best to apply water in split applications 2-3 days per week, every other day if possible, and be mindful of rain events throughout the week. Higher amounts may be needed for establishing a new yard. While irrigating with these given rates, you’ll be shooting for a little over 1/2” per acre (~14,000 gal/ac) of water from irrigation each week during bine and flower growth. While we are only able to deliver 3000 gal/ac at a time on the farm due to the constraints of our well, some water is better than none in any case. 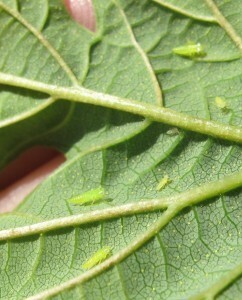 Potato leafhoppers (PLH) have arrived early this year and they were first spotted last week in Addison County hopyards. As the information is as relevant now as it was last year, we are re-posting this hop blog. Knowing what to look for and having a management plan to combat these pests will help in preventing plant damage and decreases in yields. Potato leafhoppers overwinter in southern states and are carried north with the spring wind currents. Depending on winter temperatures, these insects can arrive in the Northeast between late spring and mid-June. The warmer the winter, the further these insects will travel north. Leaf hopper populations typically peak around July 1 depending on when they arrive and then start dying down around the beginning of August. PLH management should continue over the next couple of months. When scouting for leafhoppers, hop leaves should be turned over and observed. PLH are long and skinny and move from side to side. Adults are larger than their nymph counterparts and are winged. When searching for adult potato leafhoppers, leaves of the hops plants can be shaken and the adults will often fly away. PLH may be confused with aphids which are much less active, are round in shape and are often found between the midrib and veins of the leaves. Not properly managing the leafhopper can cause significant damage in hop yards and dramatically reduce yields. The leafhoppers have piercing-sucking mouthparts that damage the leaf tissue and stem phloem of the plants. This feeding technique causes necrosis of the leaf known as hopperburn, where the tip and outer edges of the leaf to yellow and then brown. Hopperburn reduces the photosynthetic capacity of the plant and thus reduces the energy available to produce cones. That said, it is imperative that leafhoppers are managed in some way or another. 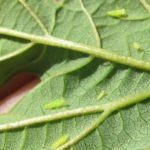 · Potato Leafhopper in Northeastern Hopyards fact sheet. · Dr. Lily Calderwood recently reviewed management options as part of our Vermont Hops Power Hour webinar series. 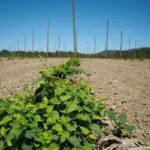 While wild or naturalized hop plants are disbursed throughout the Northeast landscape, they have not been grown in this region on a commercial scale for the past 150 years. 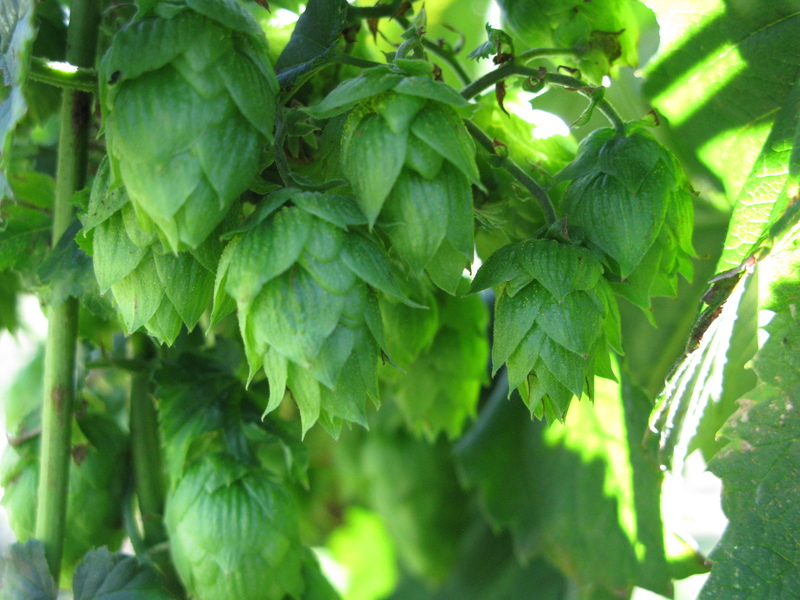 Prohibition laws of the 1920’s, the spread of hop downy mildew, and the expansion of hop production in the Pacific Northwest led to the disappearance of the hop industry in the Northeast. 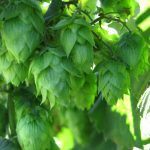 Recent and rapid growth in the craft beer industry has drastically increased the demand for local hop production. The UVM Extension NWCS team is beginning to evaluate local wild cultivars to better understand their potential commercial value. In fall of 2016, wild hop plants were gathered from eight locations in Massachusetts, New York, and Vermont. A total of 10 wild hop species are being cultivated at Borderview hopyard. 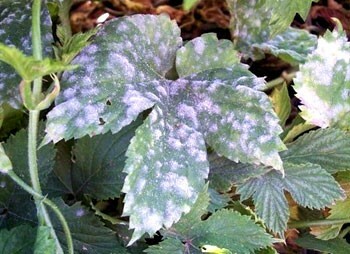 Think you found hop powdery mildew in your yard? Bill Weldon, a graduate student at Cornell University, is conducting research on hop powdery mildew for his PhD thesis. 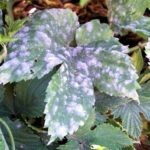 He is trying to collect as many samples of hop powdery mildew from around the country as he can, and is asking for your help should you encounter powdery mildew in your hopyard or in areas of wild hops this season. The goal of his project is to better understand the diversity found within powdery mildew populations around the country. There are two mating types (aka “aka genders”) of powdery mildew and knowing whether both genders are present within a given yard directly impacts how we manage the disease. This sample collection will also help take steps to monitor for the development of fungicide resistance in hop powdery mildew populations. Should you find any hop powdery mildew, please e-mail Bill immediately at ww395@cornell.edu and he will overnight you a sample collection kit. The sample collection process is very quick and easy. 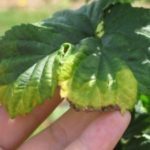 Essentially, you are just using small stickers to peel off hop powdery mildew from the surface of the infected leaf and placing the sticker in a little tube. It’s important to choose powdery mildew colonies that have a distinct round edge and haven’t grown to the point where it is merging with other colonies on the leaf. Ideally, 12 samples should be collected from each yard, evenly distributed throughout the rows of affected plants, so that he can accurately look at the diversity within the yard. Feel free to contact Bill with any questions about his project. 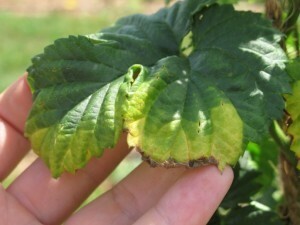 For more information about powdery mildew management in hops, check out Michigan State University IPM educator Erin Lizotte discussing that very topic for our most recent Hops Power Hour (https://www.youtube.com/watch?v=4QcMimMxDIw&feature=youtu.be), and the following article on our website: http://www.uvm.edu/extension/cropsoil/wp-content/uploads/PowderyMildew.pdf. Our next 2018 Hops Power Hour is this Monday, May 21, 2018 at Noon. Following is the presentation information, as well as the link contact information to join the webinar. Speaker: Erin Lizotte, who is a Senior Extension Educator at Michigan State University. 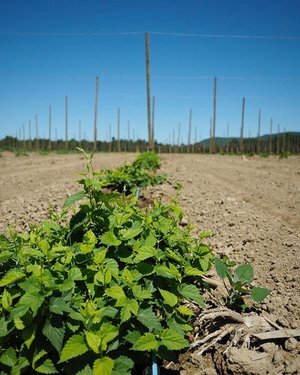 Over the past year, the University of Vermont Extension Northwest Crops & Soils (NWCS) Team has been working with many of you in the Northeast on our NE-SARE funded project to advance pest and nutrient management strategies for Northeast hop production. If you were among the more than 60 growers who participated in our project last year, we are looking forward to hearing from you again. However, even if you weren’t involved last year we are excited to have you join us. Starting Monday, April 23 at noon, we will be hosting monthly Hops Power Hours – virtual discussions that will allow us to learn and share pest and nutrient management information. Hop Agronomist Julien Venne has kindly agreed to kick off our first Hops Power Hour on April 23 to discuss early season hop yard management. We will continue these monthly webinars at noon every fourth Monday of the month, to focus on seasonally appropriate topics. See the bottom of this information for the connection information for the Hop Power Hours. You can connect by computer or call in by phone. If you are not able to join the live Hops Power Hours, you can always watch recordings of Hops Power Hours and many other videos produced by the UVM Extension Northwest Crops & Soils YouTube channel. We will also be checking in with each of you through our goScout program. Once a month we will ask you a handful of short questions about your hop yard fertility and pest management. Your responses will allow us to learn about the challenges you’re facing throughout the season and tailor the upcoming Hops Power Hours to address those concerns. Whether you were actively involved in last years’ project, entirely new to growing hops, or somewhere in between, please click here to let us know you’re onboard for the upcoming season by completing a survey. If you participated last year, you will simply be asked for optional feedback on the project so far. 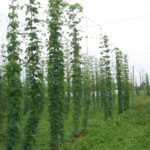 Newcomers will be asked to fill out a quick introductory survey that allows us to collect basic information about your hop yard, your level of understanding of hop yard management and goals for what you would like to learn more about as a part of the project. If you have any questions about the project, please email Scott Lewins (slewins@uvm.edu) or John Bruce (jbruce@uvm.edu). Join us for our 9th Annual Hop Conference, where we will have a full morning session and opportunities to attend either advanced or beginning production sessions in the afternoon. Speaker highlights during the day include Roy Desrochers, of Tufts University who has over 34 years of experience using sensory technology to help brewers around the world develop and maintain winning products in the marketplace, will provide us with an interactive taste and aroma presentation; Pam Miller, owner/partner of Hopyards in Greenville, Michigan, will share with us how we can succeed in a Niche Market; Rob Sirrine of Michigan State University Extension will speak about successful hop systems in MI; and Dr. Heather Darby and her team will share hop research updates. View our detailed agenda with speaker bios for the Hop Conference. The Hops Live Broadcast will include the morning session and the advanced sessions during the afternoon. 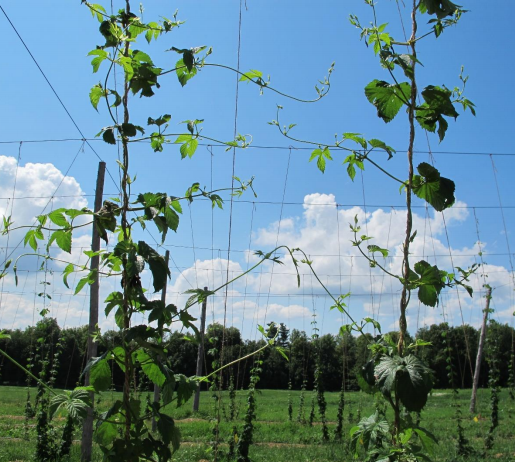 Our beginning hop grower session will include information on constructing a hop yard, hop yard trellis design, basic hop agronomy and pest management, irrigation, and harvest and post-harvest processing. There will also be vendors and exhibitors to visit and gain information from! Cost is – $75 per person; $65 per NeHA member and $35 for the Hops Live Broadcast. If you have questions, call Heather or Susan at 802-524-6501 or 1-800-639-2130 (toll-free in Vt. only).